Coastal fishing communities and working waterfronts are intricately linked to the marine ecosystem on which they rely, and thus play a critical role in fisheries management. They support a suite of community-based fishing related activities (i.e., commercial, recreational, and subsistence) and sustain the intergenerational fishing culture that forms the economic and social fabric of the coastal United States. These fishing activities support industries and infrastructure, chefs, eateries, seafood retailers, tackle shops, educational institutions such as aquaria and research laboratories, as well as generate an economic multiplier effect when revenue stays within a community. The Network advocates for transparent policy that promotes and prioritizes both healthy fish populations and community-based fishing interests, with sustained access to provide a reliable supply of locally important seafood, to maintain the myriad of interdependent businesses supported by the various interests, and to create rewarding recreational experiences. For recreational fishing, access and catchability are key to the sports experience. Likewise, community-based fishermen need abundant fish populations to ensure their industry thrives for generations to come. Fishermen of all types recognize that healthy fish stocks require effective management of how many and what types of fish are taken from the water. Fisheries are managed using a number of tools that control “inputs” (fishing days, trip limits, etc.) and “outputs” (allowable catch levels, catch quotas, etc.). Within commercial fishing, these tools are frequently implemented under the umbrella of a limited access privilege program (LAPP) while other times they’re used on their own. Simply put, managers have a wide range of approaches to choose from when determining how best to manage a fishery. If some of these options, however, are implemented without community protections in mind, they can weaken the fabric of our traditional fishing communities. Fishing access – or the ability of fishermen to harvest fish – is highly susceptible to management regimes that forgo community participation. This oversight has left many historically vibrant working waterfronts vacant and obsolete. Community-based fishermen, commercial or recreational, are often difficult to define. There may or may not be geographic boundaries or logistical ones. Within the commercial sector, there may or may not be vertical integration and participation in the seafood supply chain. These fishermen may traditionally be small-boat owner-operators, but that’s not always the case. 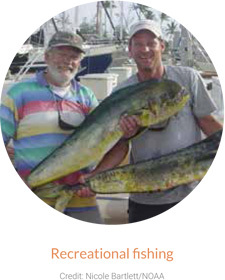 The recreational sector has larger charter boats and smaller guide boats, and non-commercial sport fishing boats—all of which contribute to coastal communities and culture. In the end, community-based fishermen all have a few things in common – a sense of place, a core identity, a belief in maintaining their communities, and a drive to improve their fishery for those around them and for the future generations. To the extent that MSA can embrace and protect these fishermen, their fisheries and communities, it should. MSA reauthorization must first and foremost focus on measures to sustain and increase the abundance of our nation’s fisheries. In addition, MSA should require regional fishery management councils to prioritize the health and sustainability of coastal communities and their fishing sectors when managing regional fisheries. This should be done by designing and implementing policies scaled to the needs of the community-based fishermen in their council regions. This could include a greater emphasis on protecting and creating sustained fishery access, working waterfronts, and seafood infrastructure with an eye towards the values and sense of identity associated with the region’s communities. Anchoring some percentage of Limited Access Privilege within a community association (the two options in section 303A of the MSA are “Fishing Community” (FC) and “Regional Fishery Association” (RFA)) that meets criteria defined by the appropriate fisheries council. To date, no council has established criteria for FCs and RFAs. It’s unclear why. Current language in the law allows but does not direct or require councils to develop criteria for fishing community allocations under a LAPP. The revised law should require that councils explicitly consider community allocations during the development of any new LAPP. For new LAPP’s, councils should be required to establish criteria for 303A Fishing Communities and Regional Fishery Associations to hold quota at the community level to ensure access and sustained participation. Strengthening and refining National Standard 8 to ensure and enhance sustained participation by community-based fishermen. a. NS 8 currently requires conservation and management measures to provide for the sustained participation of fishing communities and to minimize adverse economic impacts on such communities. This standard should be strengthened to include clear measures that will minimize adverse economic impacts while achieving conservation goals, and secure sustainable participation in fisheries. Modifying the penalty for noncompliance with community sustainability plans. b. Under the current MSA, the Secretary of Commerce must deny or revoke LAPPs granted under this section to any person who fails to comply with the requirements of the fishing community sustainability plan (303A(c)(3)(ii)) or the RFA plan (303A(c)(4)(B)). While it is both reasonable and desirable to enforce those plans, revocation of a LAPP is unreasonably harsh and a strong disincentive for any LAPP holder to participate. As such, the revised law should clarify that the Secretary “may” deny or revoke, and that suspension time and reallocation of privileges shall meet a set of criteria developed by the relevant council, approved by the Secretary and published in the Federal Register. Amending Section 303(a)(9) to require a fishing community plan. c. In addition to requiring development of a fishing community plan, this provision must detail how commercial fishing businesses and recreational fishing interests will be accommodated and what strategies will be implemented to provide for the sustained participation of fishing communities. Providing entry-level opportunities for community-based fishermen. Develop and implement MSA language that advances permit banks and fishery trusts to sustain fishing access for community-based fishermen. Define “community-based fishermen” as: Those commercial fishermen who live and/or work within fishery dependent communities of this Nation, and whose catch is delivered into these communities for processing and/or marketing, and those recreational fishermen and businesses who reside in and rely upon coastal communities for infrastructure support and access for their sports experience.